Lock your secure Excel, Word, PowerPoint Documents to specific User, Computer or USB Drive. Define High Security Expiration Date or Working Duration for your DRM protected Excel, Word, PowerPoint Documents. Define Printing watermarks for your protected documents. Support full features of Microsoft Office Excel, Word and PowerPoint applications for protected documents. Control and apply all required limitations for your users using a very small user side DRM manager component ( OwnerGuard License Manager ) . Minimize your users DRM hassles by letting them access your DRM protected documents offline. Distribute and Sell your DRM protected documents easily while you’ve got full control over them. Cooperate in Creating, Editing or distributing Office documents while OwnerGuard protects ownership rights for owner(s). Gain full control over your sensitive documents usage rights. Feel free to Store, transfer and share your protected contents using your desired method and media just like before. Advanced 512 bit unique encryption system for DRM Protected Microsoft Office Documents. Advanced digital rights protection system to protect your ownership while new Documents are creating using your DRM protected Microsoft Office Documents. Support a wide range of limitations for users including Machine-Dependency, Working Duration, Expiration Date, Print Watermarking, Printing, Clipboard, Modification, Screen-Capture, OLE Drag&Drops and …. Fully automated serial based licensing system. Support Machine Dependent/Independent license codes. 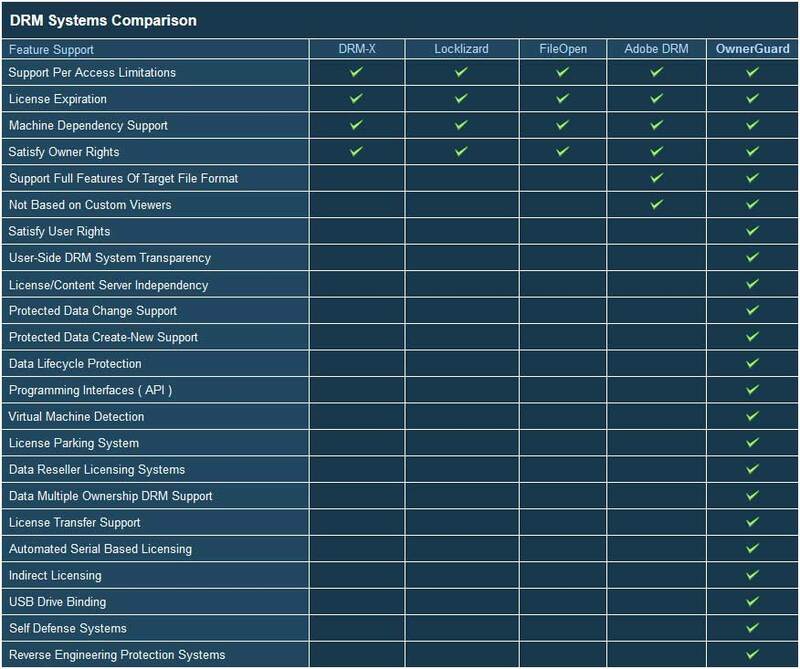 Protection and Licensing Application Programming Interface (API) for customization and full integration. Support Machine Dependent/Independent licenses to Lock your DRM Protected Excel, Word, PowerPoint Documents to specific computers. Multiple projects creation and management to make groups for your protected Microsoft Office documents. Hierarchical reseller licensing system to ease license distribution on the net. Built in support for integration with windows Active Directory and Group Policy. Note : User Edition (License Manager) is provided as a part of Advanced, Enterprise and Server Packages and can be distributed to unlimited number of users. You can request a licensing demonstration about Office Security OwnerGuard packages using our request form.